Television has been one of the biggest entertainments since its invention. From its evolution in black and white format, the television technology has later developed to bring colour visuals in CRT displays and later LCD, LED and also Plasma. Nowadays we can get TV’s that is almost 61-inches wide and that too with a very small thickness. The visuals are also in High-def format, which is so clear that we feel like sitting in front of it the whole time. With later developments in the TV technology, one question arises in our minds…WHAT’S NEXT?? The answer is clear…3-D technology!! The surprising factor about 3-D Technology is that it was first tried in the year 1922 for a movie called “The Power of Love”. Since then people have been trying to develop the technology. During the 1950’s movie producers were trying to attract people into theatres. For that, they also tried to simulate shock in the audience seats while showing a horror film. 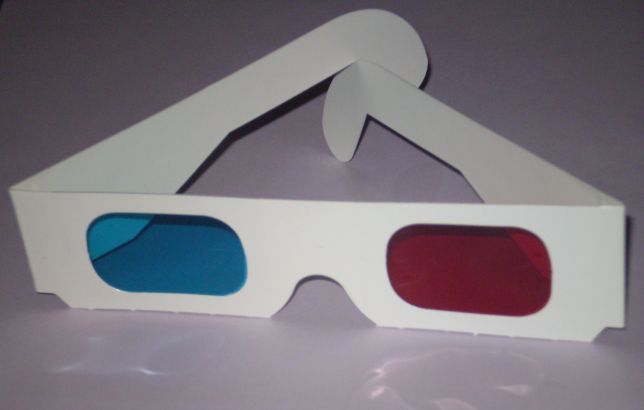 Apart from this the movies were shown in 3-D format to bring the pictures live. All the audience had to do was to wear a pair of glasses. After the release of major movies like Avatar, Clash of the Titans, Up in the Air and so n in the 3-D format, even TV manufacturers decided to make 3-D TV’s for home purpose from the year 2009. A 3-D image is obtained by displaying different images to each eye. This when joined by the brain, will produce an illusion of a 3-D image. This method is called stereoscopy. Thus a 3-D TV is a special television that has various methods to deploy 3-D images so that people can experience a realistic 3-D field. There may be doubts on why a person cannot view a 2-D image in the 3-D way in real world. Why do the objects we see in television screens appear flat? How does 3-D technology solve this problem? All these problems arise mainly due to the way we visualize things. When our eyes focus on a particular thing, they tend to absorb the light that is reflected off from them. This light that is absorbed is converted into an image by our brain. The light that enters into one eye will be parallel to the light that enters into the other. But this occurs only if the objects are far away. As the objects become closer, the lines will not be parallel. They will join together and thus our eyes will have to compensate for it by shifting. Thus, the work that your brain does to adjust the focus of your eyes to see the object determines how far away the object is. In case of a 3-D image, our eyes will see the same image in different perspectives. Thus the real flat image that you see will have a virtual depth. The difference with 2-D is that the convergence of the image and its focus in your brain will not match up in 3-D. Your eyes will have to converge two different lights for just one object that is in front of you. This method will make the brain work a lot more even if the screen is kept at a distance. Thus, your eyes tend to strain if you keep on watching a 3-D movie for a long time. From the above discussion it is clear that our eyes cannot do the work of combining two different lights into one. This has to be done by an external object. This external object differs in the types of lenses that we use to view the image, or even on the type of TV that is used. This is one of the first and oldest methods that were used to view a 3-D image. The 3-D images were made by separating the right and left images using colours. The image will have two colour layers. These layers will be separated by using glasses that will have blue and red displays. These coloured glasses will be made with the help of cellophane papers, as they are cheap. If you look at the projection without your glasses, you can see two sets of images that are offset from each other. One of them will have blue shading and the other one will have a reddish hue. But, when you put on the glasses, you will see a single clear image. Thus the eye behind the red glass will see the clear blue images and the eye behind the blue glass will only see the clear red images. Though both the images are the same in your brain, but in different colours, the convergence will be at a different point from the actual focal point. Thus the illusion of depth in the image will be easily created. Thus an Anaglyph 3D image is obtained. The only problem is that you will not be able to see most of the original colours in the image. The problem is that you lose colours in the image. Thus it is not a good method. 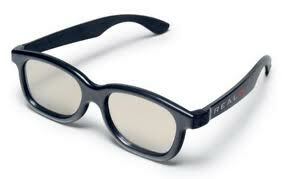 This is the best passive method for watching a 3-D movie. For this method you need a pair of basic polarized sun glasses and a polarized filter connected LCD display. 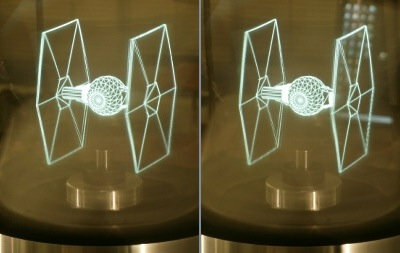 The display will send out two images, each having a different polarization than the other. When the image hits each polarized glass, it filters the image and then comes in contact with each eye. Thus the brain makes a 3-D virtual image for the viewer. Though the TV of such a kind is expensive, the polarized glasses are very cheap. This method is now used in most cinema theatres. For a movie to be shown in polarized view, the movie has to be shot with two different lenses. To projectors have to be setup with polarizing filters attached to their lenses. Both the projectors will project the movie on the same screen at the same time. Thus the image from the projector falls on the filter first. The images that hit the filter from the left projector will be oriented on one plane and that by the right projector will be in a perpendicular angle to the left one. The polarized glasses that the viewer wears will have different polarizations. The left lens will be in the same alignment with the left projector plane and the right lens will be in a perpendicular alignment in accordance to the plane of the right projector. Thus the corresponding images produced by the left projector will be seen by the left eye and the images produced by the right projector will be seen by the right eye. As both of them have different perspectives, the brain combines the two lights t form a single virtual 3-D image. Here also there is a similar disadvantage like that of shutter glasses. The light available in the eyes will be lessened. Thus the images may appear darker than it originally is. As the name indicates, both the glasses alternately shut off the left eye and the right eye, when the TV emits separate images for each eye. The advantage of this method is that a 3-D image is easily created in the viewers mind. We all know that the video signal has two fields. One is the odd field and the other is the even field. The image that is to be sent to the right eye is stored in the odd field and the one meant for the left eye is stored in the even field. There will be synchronization between the shutter glasses and the TV. The wireless interaction will be through radio frequency or infrared. The shutter glass is made of liquid crystal and a polarizing filter. As soon as a signal is received by the shutter glass from the TV, the circuit in the glass will automatically forward a small current on to one of the glasses. This makes glass becomes dark in nature like a shutter for a fraction of a second. This means that when a viewer is watching a video in 3-D, only one eye of his is open at a time, and only one image is seen at a time. Thus, the image in he even field that was meant for the left eye, will be seen by the left eye. The right eye will be able to see the odd field video signal as well. As these images are viewed from different perspectives, our brain tries to join them as a 3-D image. The closing and opening of each glass may seem inappropriate thinking that the viewer may not be able to see some of the images. But as the latest televisions have very high refresh rates, the pictures are guaranteed to be clear and smooth.Â If the refresh rates are not high you may be subjected to headaches. The refresh rates must be at least 60 hertz for each eye. This means that there must be a refresh rate of 120 Hertz for both the eyes together. This makes the TV more costly. Apart from that the glasses will also be costly as they include 2 LCDâ€™s and batteries for its power. The only disadvantage with this method is that enough light will not be received by our eyes as it is subjected to rapid opening and closing. Thus the images may seem to be darker than it is. This type of TV does not need 3-D glasses to see the 3-D images in your TV. 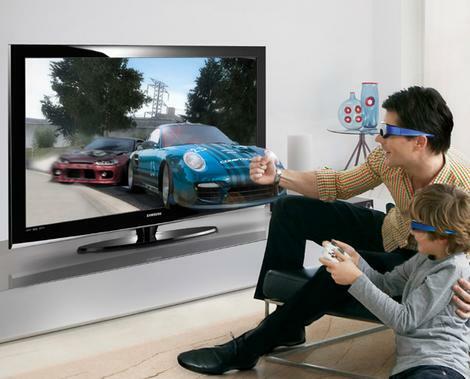 This means that you can view the 3-D images even without the use of any active or passive glasses. Â Some of the basicÂ types of Autostereoscopic TVâ€™s are explained below. Lenticular Lenses has been detailed explained in another post. To know the basics of Lenticular Lenses and their advantages in 3-D viewing, click on the link below. The basics on Parallax Barrier has already been explained. To know the basics of Parallax Barrier and their advantages in 3-D viewing, click on the link below. We have already discussed various methods on how to make a virtual 3-D world for watching movies and other entertainments. But, what if we could make a real 3-D world? Yes, that is what Volumetric Display is all about. Though the developments on this technology are not standard enough for practical applications, researchers all over the world are trying their best to create them. For this method to be practical in nature there must be the use of lasers, and also rotating and vibrating mirrors. A recent display of such kind was made by using a high speed rotating mirror, and a high quality projector that projects the image on it. By this method you will get a 360 degree view of a 3-D image, which is a real 3-D image. Recently some researchers from Japan developed the world’s first touch screen 3D television system. Through such a TV you can manually operate all the settings that is needed in a TV and also watch the videos in 3-D mode. The virtual world is made with interesting touch capabilities that you are able to feel the images like they are floating right in front of you. Further developments are made so as to bring changes in the image manually by just touching them. This concept will surely revolutionalize the gaming world as well. Players can experience a new sensation by holding weapons or sports utilities while playing a game. As the developments are not going in high speed, there are doubts as to when this technology will come in practice. This technology can also be used to create virtual buildings or museums, where you get to learn everything by touching them. With the technology of 3-D TV developing further, 3-D cameras will soon come to use. But the only problems with this technology is that you will have to shoot the content in 3-D format and the shot content will have to viewed in 3-D TV. Thus the expense will be high. But if this method is further popularized, the price may become less. The other problem of shooting in 3-D is that you will need two cameras. These two cameras should be placed at correct angles and they should work synchronously. Huge companies make 3-D cameras by installing two lenses in the same camera. This can revolutionalize the world for sure.